A person’s health is often calculated through a series of inexplicable numbers: blood pressure, T-cell count, weight, hormone levels. This practice isn’t new: doctors and laypeople alike have tracked visible and invisible changes in the human body for generations. But newer technologies, from FitBits to fetal monitors, are making it easier for us to collect and share information about our bodies. What do these technologies mean for our health, our privacy, and the future of our society? Join the scholars and staff of the Institute’s Center for Applied History to learn about health tracking through the ages, discuss the varied uses of health data in today’s world, and debate the ethics of trying to predict the future of our bodies. Discussion led by Deanna Day. This event is free, but registration is required and it is SOLD OUT! “The Most Horrible Seaside Vacation,” Patient Zero, RadioLab. Arielle Duhaime-Ross, “Apple’s New ResearchKit: ‘Ethics Quagmire’ or Medical Research Aid?” The Verge, March 10, 2015. Deanna Day, “Exercise without Failure: Building Fitness Apps as Narrative Games,” Model View Culture, April 29, 2015. Deanna Day, “The History of Data Is the History of Labor.” Lady Science, March 16, 2017. Deborah Zoe Laufer, Informed Consent, 2014. Natasha Dow Schull, “Our Metrics, Ourselves,” Public Books, January 26, 2017. Jennifer Weeks, “Health by the Numbers,” Distillations, Spring 2015. Join the Institute’s Center for Applied History this summer for History Lab, a series of free monthly seminars taking place from June through August, to explore topics ranging from science fiction to medical self-tracking. For more information, please contact program associate Rebecca Ortenberg at 215.873.8247 or rortenberg@sciencehistory.org. 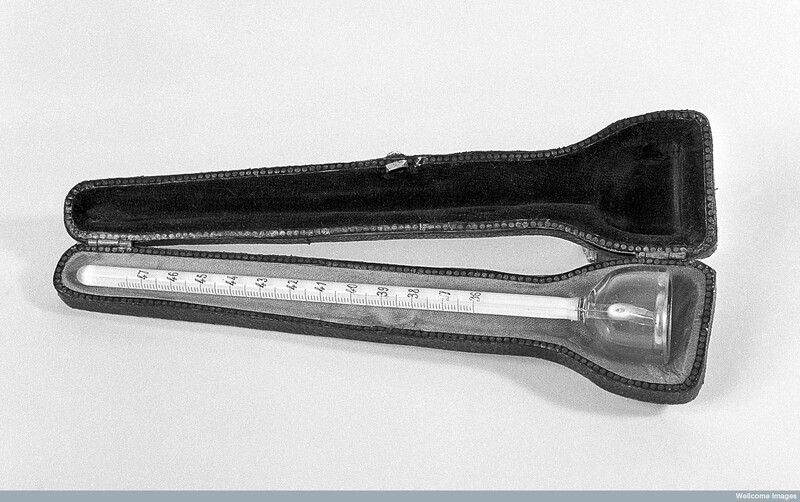 Image credit: Surface thermometer, centigrade maximum 1/10, Wellcome Library, London.